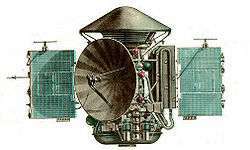 The plan calls for a Russian launch vehicle to deliver the Russian-built surface platform as well as the ExoMars rover to Mars' surface. 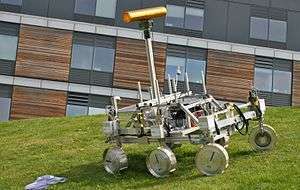 Once safely landed, the platform will deploy the rover and will start a one Earth-year mission to investigate the surface environment at the landing site. A magnetometer named MAIGRET. Developed by Russia. The instrument will incorporate the Wave analyser module (WAM), developed by Czech Republic. Set of cameras to characterise the landing site environment (TSPP). Developed by Russia. Gas chromatography-mass spectrometry for atmospheric analysis (MGAP). Developed by Russia. Russia is evaluating the options to use of a radioisotope thermoelectric generator (RTG) to power the science instruments, and a radioisotope heater unit (RHU) to provide thermal control on the frozen Martian surface. 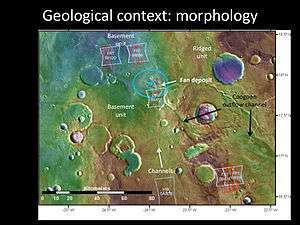 On 21 October 2015, Oxia Planum was chosen as the preferred landing site for the ExoMars rover assuming a 2018 launch. Since the launch was postponed to 2020, Aram Dorsum and Mawrth Vallis will also be considered. 1 2 3 "Exomars 2018 surface platform". European Space Agency. Retrieved 14 March 2016. 1 2 "N° 11–2016: Second ExoMars mission moves to next launch opportunity in 2020" (Press release). ESA. 2 May 2016. Retrieved 2 May 2016. 1 2 "Russia and Europe Team Up for Mars Missions". Space.com. 14 March 2013. Retrieved 24 January 2016.